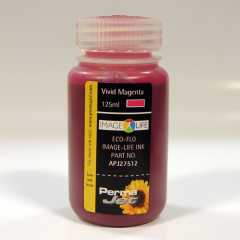 IMAGE-LIFE Refill Inks - supplied with all PermaJet's very latest Eco-Flo systems including the R2880, R3000, SC-P600 & also the 3800/3880 Refillable Cartridge System. All colours are supplied as 125ml bottles and are UK manufactured and produced to the very highest quality specifications. Being used by many professional artists or photographers on a day-to-day basis producing archival work worthy of any gallery or exhibition. Feel free to click on the technical tab to view the ink Test Certificates and report conducted via an independent UKAS Laboratory on PermaJet media with PermaJet & Epson inks where archival stability meets and exceeds the required 85 year print life stipulated by the Fine Art Trade Guild for 'giclee' certification.